"In this county as we mentioned last week, the only contest was between the friends and the opposers of a tax on Bank-Stock. The friends to the tax run a full ticket; with Charles Clark, who last year in the House voted for the tax, at its head as Candidate for Council. 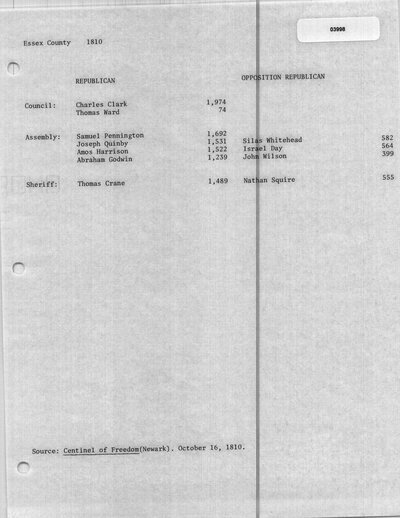 The opposers of the tax run but a partial Ticket consisting of the Members of Council and two Members of Assembly who last year voted against the tax...The influence of this question extended even to the election of a Sheriff; and Thomas Crane, who avowed himself friendly to a tax on Bank-Stock, received 1489 votes; while Nathan Squier, who had some years ago been Sheriff, and discharged its duties with fidelity and approbation, but who last year voted against taxing Banks, had but 555." The True American (Trenton, NJ). October 22, 1810. The Centinel of Freedom (Newark, NJ). October 16, 1810. Trenton Federalist (Trenton, NJ). October 22, 1810. The True American (Trenton, NJ). October 22, 1810.